With the rise in popularity of HBO’s hit show “West World,” there has also been a surge in popularity for Southwest culture and fashion. People love to imagine the cowboy chic styles and weave that fashion into their own wardrobes. One concept that keeps coming up in the show is “The Maze,” a symbol which frequently comes up in the form of carvings and paintings that decorate the landscape of small towns and saloons in the show. If you’re a fan, you might be wondering what the maze symbol means. It actually traces its origin in reality, more specifically Native American culture. 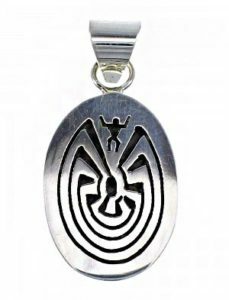 The Man in the Maze is a symbol that has appeared for hundreds of years in Native religion and the meaning is somewhat consistent through the tribes of the Southwest plains. The symbol can be understood as the journey of life. The man depicted at the beginning of the maze represents birth; the pathways are then the twists and turns of life. People make decisions in life and those are mirrored with the set forth in this image. The center of the maze has a few different meanings, depending on the tribe’s beliefs. The most popular interpretation for the center is a person achieving their life’s goal. For example, a person that’s always dreamt of being president and then becoming one would have reached the center of their maze, their personal life goal. Others might interpret the maze as true understanding and harmony in life. Since the paths represent all that life encompasses: sadness, joy, regret, love, loss, etc. the center would represent the culmination of all these experiences and conclude with an absolute understanding of life and its place in nature. Native American culture is deeply spiritual and intensely beautiful. The dedication and time that went into making the show is a testament to the team’s attention to detail. 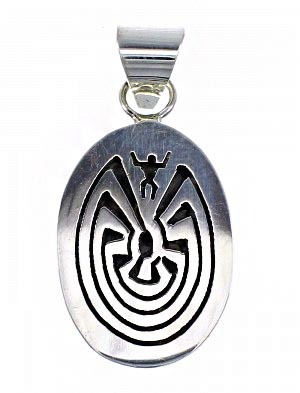 I would also be remiss if I didn’t mention that Native artists use “The Man in the Maze” symbol a lot in jewelry. Just click here to find your own path in life.